In just a few years, astroparticle physics has grown from a field of a few charismatic pioneers, transcending interdisciplinary frontiers, to a global science activity with large infrastructures and collaborations each involving hundreds of researchers. This transformation has been characterised by the intensive construction of large astroparticle physics experiments and detectors. In the past decade, the projects have passed from the noise hunting regime to the generation of large sets of data, which need large computing resources, intensive simulation, and large storage space. The data need to be cast in formats and be accompanied by software permitting wide accessibility as well as correlation with information generated by other observatories of astrophysical or cosmological type. The issues of computation, data mining complexity, and public access are extremely challenging. 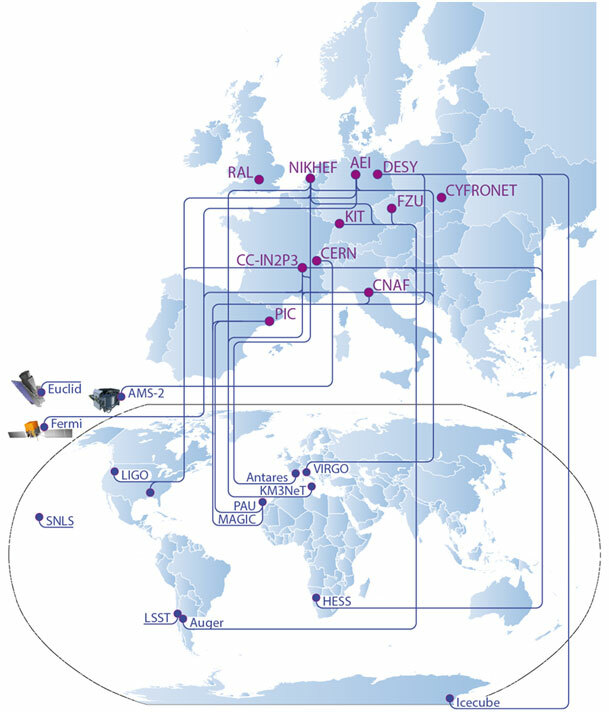 Data flow from the individual experiments to the European data centres. (Source: APPEC Computing Model for Astroparticle Physics). The computational challenges were presented and contrasted with the data storage and analysis models developed in neighbouring fields of particle physics (grid and cloud computing, large databases) and astrophysics (virtual observatories, public access). 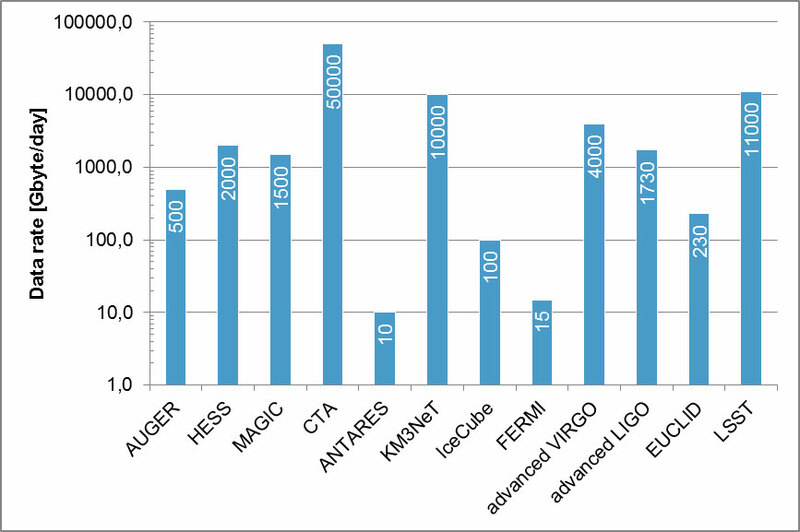 Review of current computing models developed by upcoming astroparticle observatories, including CTA, KM3NeT, Auger, VIRGO/LIGO, and LSST. The workshop focused on hardware and technology. A total of 143 people participated in the three computing workshops. The discussions clearly demonstrated the high level of complexity of the topic and the need for further coordination between all stakeholders. Several meetings followed to analyse and discuss input from the community and to produce intermediate drafts of the document (July 16, 2013 in Paris; October 29, 2013 in Geneva). A final meeting to scrutinise the numbers for computing needs and define the final document structure took place in Bologna (April 14/15, 2014).